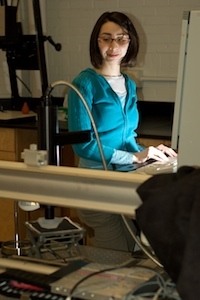 Our laser spectroscopy group focuses on fundamental questions of chemical physics. 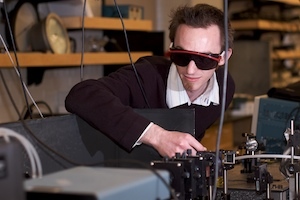 High-power tunable laser systems excite and ionize molecules to investigate positions and intensities of individual quantum states. The results provide information on the dynamics of intramolecular energy transfer and relaxation. We have developed new, molecular beam techniques to study ultracold plasmas. Most of the matter in the universe by far exists in the form of a plasma, at temperatures ranging from a few million Kelvin in stars to a few hundred Kelvin in a flame. We form a plasma from molecules cooled to less than 1 K. Under these conditions, Coulombic forces can dominate the thermal energy of the ions and electrons, allowing strong correlations to develop resulting in liquid-like effects and crystallization. The study of ultracold plasmas represents a new avenue of plasma physics. Results we obtain will help to understand conditions in plasmas at similar states of correlation in the cores of dense stars or under conditions of thermonuclear fusion. Students in our Raman spectroscopy group design new instruments to collect spectra from biologically relevant samples with sizes down to microscopic dimensions. We analyze spectra using sophisticated multivariative classification techniques to obtain information on the state of the sample and its chemical composition. Williams, J. A. S. ; Qu, X. ; Rios, P. ; Wieland, J. ; Grant, E. A Switching Rule For Plastics Identification In Electronics Recycling. International Journal of Computer Integrated Manufacturing 2008, 21, 730-743. Morrison, J. P. ; Rennick, C. J. ; Keller, J. S. ; Grant, E. R. Evolution From A Molecular Rydberg Gas To An Ultracold Plasma In A Seeded Supersonic Expansion Of No. Physical Review Letters 2008, 101, 4. Viteri, C. R. ; Gilkison, A. T. ; Schroder, F. S. ; Grant, E. R. Discrete-Continuum And Discrete-Discrete Interactions In The Autoionization Spectrum Of (Bh)-B-11. Molecular Physics 2007, 105, 1589-1602. Viteri, C. R. ; Gilkison, A. T. ; Rixon, S. J. ; Grant, E. R. Isolated Core Excitation Of (Bh)-B-11: Photoabsorption In Competition With Rydberg Predissociation. Physical Review A 2007, 75. Viteri, C. R. ; Gilkison, A. T. ; Grant, E. R. Dynamics Of Dissociative Recombination Versus Electron Ejection In Single Rovibronic Resonances Of Bh. Journal of Chemical Physics 2007, 126. Wikstrom, H. ; Romero-Torres, S. ; Wongweragiat, S. ; Williams, J. A. S. ; Grant, E. R. ; Taylor, L. S. On-Line Content Uniformity Determination Of Tablets Using Low-Resolution Raman Spectroscopy. Applied Spectroscopy 2006, 60, 672-681.